A band of sandstone stretches across the valley. I don’t like coal. It’s a dirty fuel whose negatives far out weigh it’s positives. But coal is cheap energy and it isn’t hard for a hand full of people to get rich, fast. So the world continues to find a source for their coal habit. One such source is Alaska and the Alaska Range. 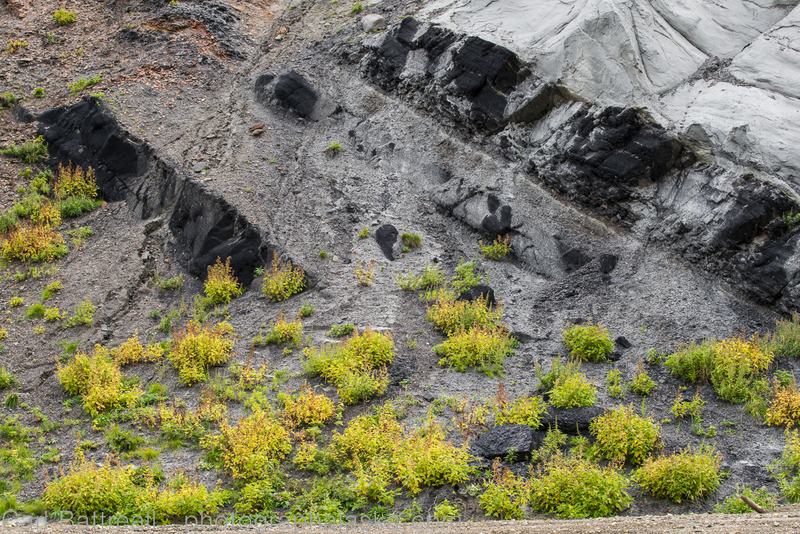 It is estimated that Alaska has one of the largest coal reserves in the world. The Alaska Range is home to the only active coal mine in Alaska, a massive open-pit mine near Denali National Park and Preserve. 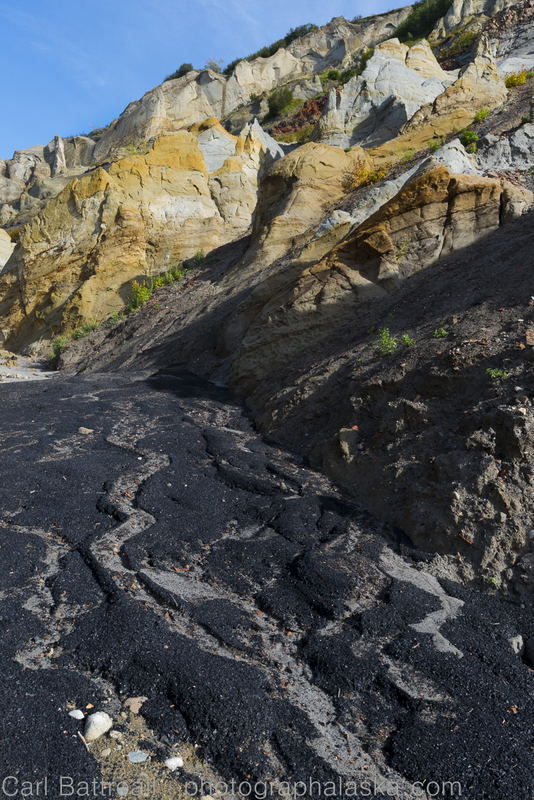 Bands of coal in the cliffs. The Usibelli Mine is about 20 miles from the entrance to Denali National Park and Preserve. Founded in 1943 outside Healy, the mine sells coal to six state power plants as well as South Korea and other Pacific Rim countries. The exported coal is transported on the Alaska Railroad about 300 miles to Seward, which is an ice-free port and home to Kenai Fjords National Park. Alaska? Looks like Utah or Arizona. In September, my Dad and I did some exploring in the mountains east of Denali National Park, near the Usibelli mine. 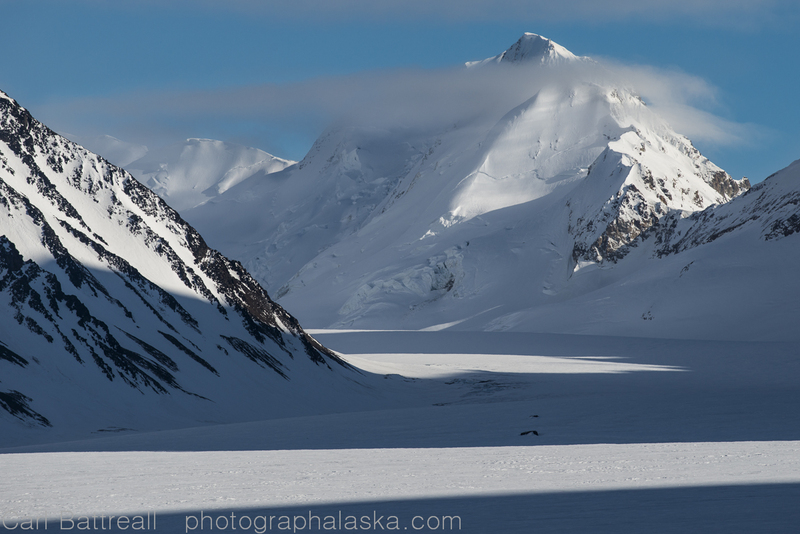 I have seen signs of coal during many of my expedition in the Alaska Range, but in this area, it literally oozes out of the mountains. It is a bizarre landscape, resembling Utah or Arizona. Honestly, I have never really seen anything like it in Alaska. 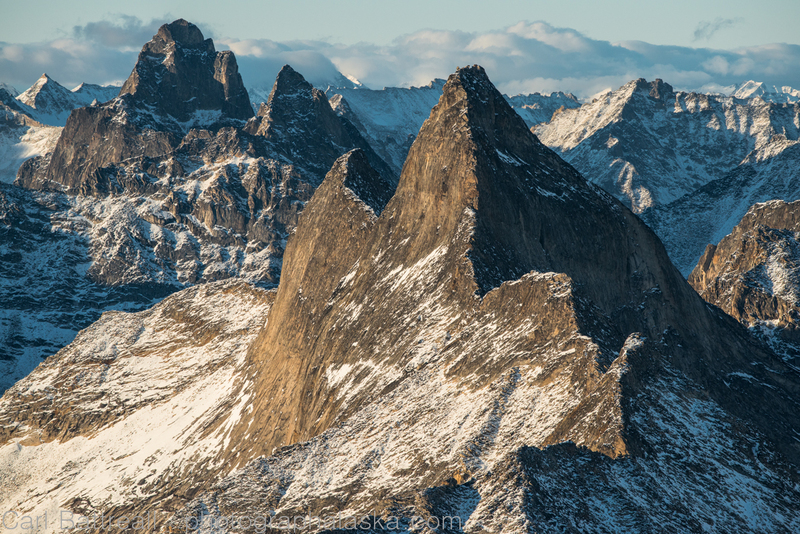 The Delta Mountains have some pockets that look similar, but this area is really special and fun to explore. coal and oil ooze out of the mountains. There are a collection of narrow canyons you can follow. 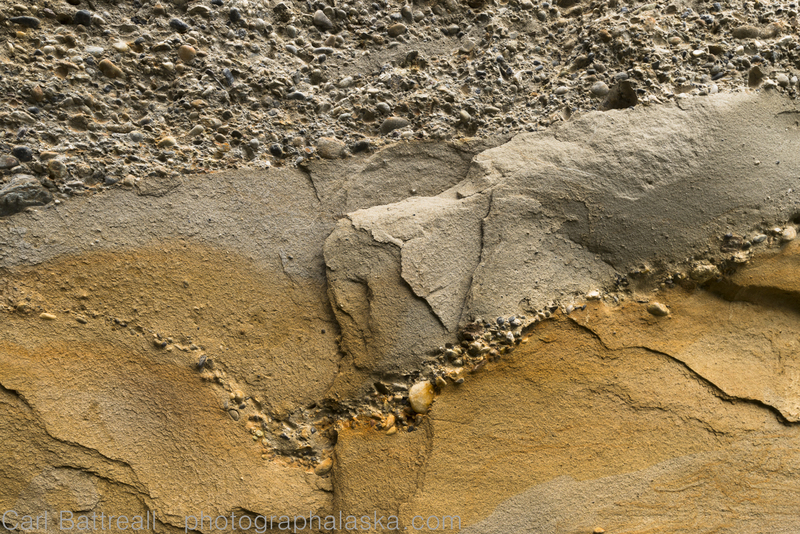 The sand stone in these canyons is super soft and crumbles easily, the ground was moist and gooey. We were forced to stay in the canyon bottoms, though occasional I would try to scale the cliffs to get a better perspective, boots sinking into the sticky soil. 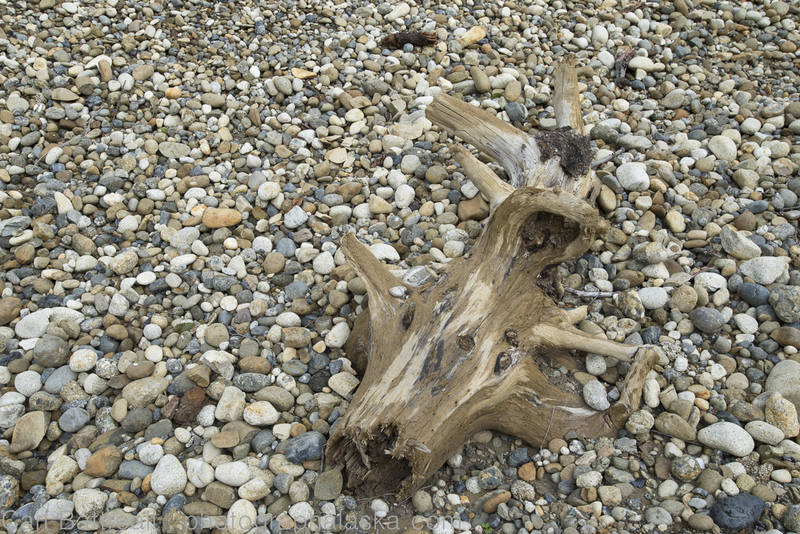 I spent as much time admiring all the fascinating rocks as I did taking photographs. 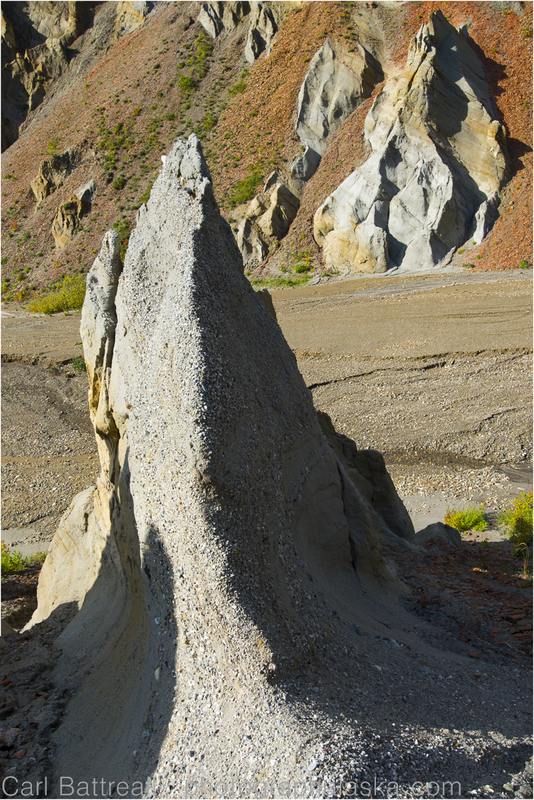 We both felt that at any moment we would stumble upon some great fossil of a mammoth or dinosaur and we naively searched, having no idea what to look for. 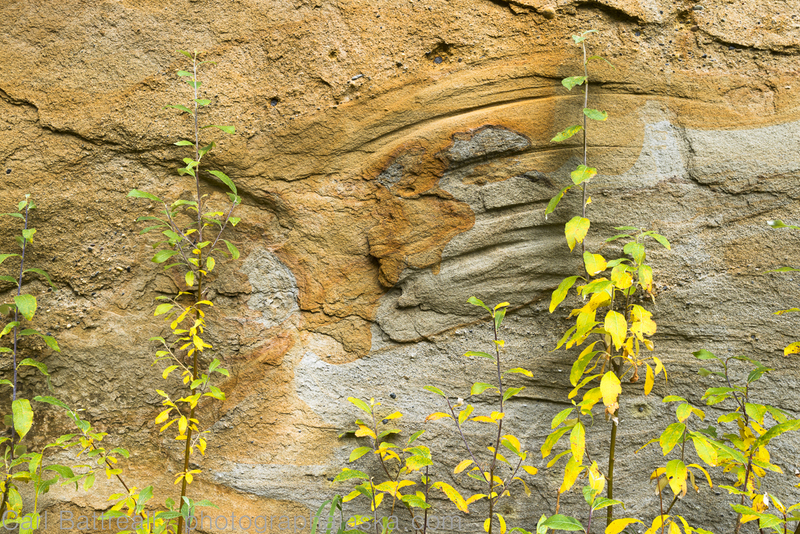 The sandstone is so soft that this willow, blowing in the wind, creates grooves in it. 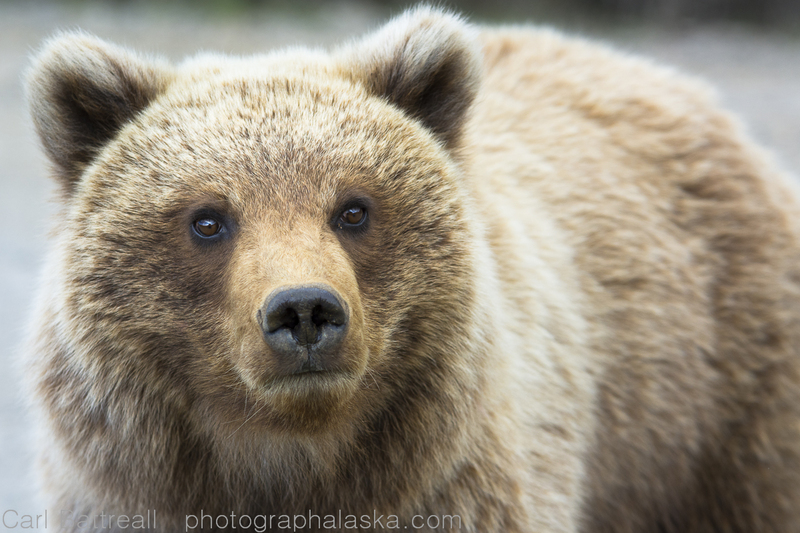 I have been bullied and harassed throughout my years photographing in the Alaska Range. I have been told by many an old-timer to “Stay out of their mountains” and to “leave the miners alone”. These sourdoughs still cling to the frontier Alaska of long ago. A time of Mom and Pop mines, rough lives living in the Alaskan bush, adventure and solitude in remote wilderness. 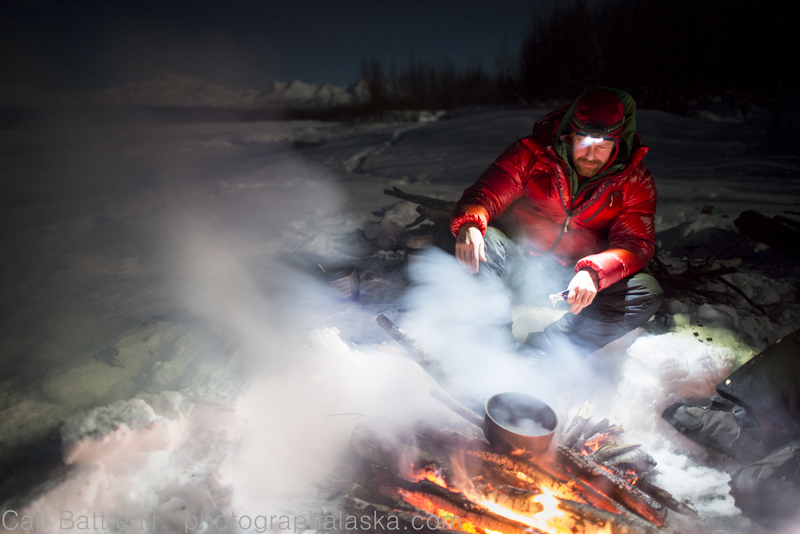 That Alaska spirit of solitude and adventure still exist. It is alive and well in the hearts of guides, bush pilots, boat captains and remote lodge owners. 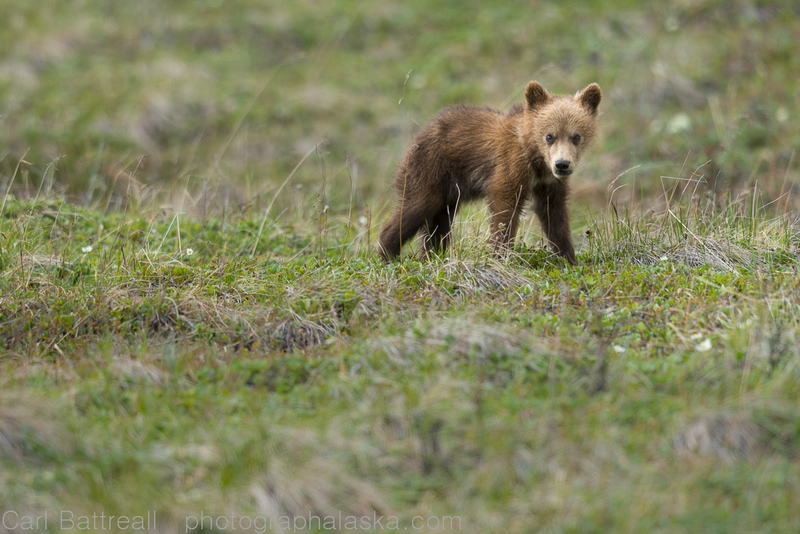 It is alive and well in Alaska’s wilderness, wildlife, healthy rivers and ocean. To me, there in nothing that screams non Alaska more than big industrial coal and gold mines. Mines run by big business, with product and money being sent to foreign markets. Mines that actually threaten the things that make Alaska different then anywhere else in the world, the things that make Alaska…Alaska. 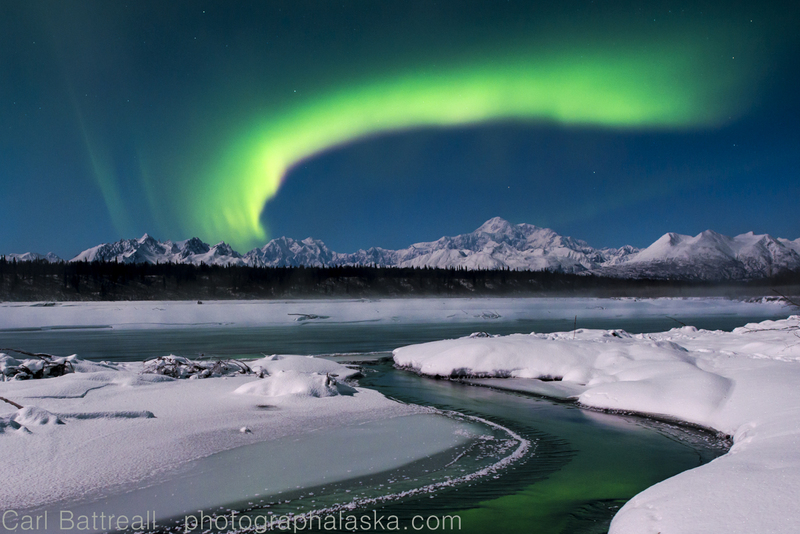 Wild Aurora over the Tokosha Mountains, Mount Hunter and Denali. I have never been a fan of roadside photography or images of iconic places during “perfect” light. I like to photograph the unfamiliar, I like the challenge of the unknown. Don’t get me wrong, I am a diligent trip planner, I can spend months looking at maps and Google Earth. But once I am in the field, I like to just “go with the flow”, work with what the wilderness gives me. However, I am a professional photographer and sometimes I need to “go after” a shot. 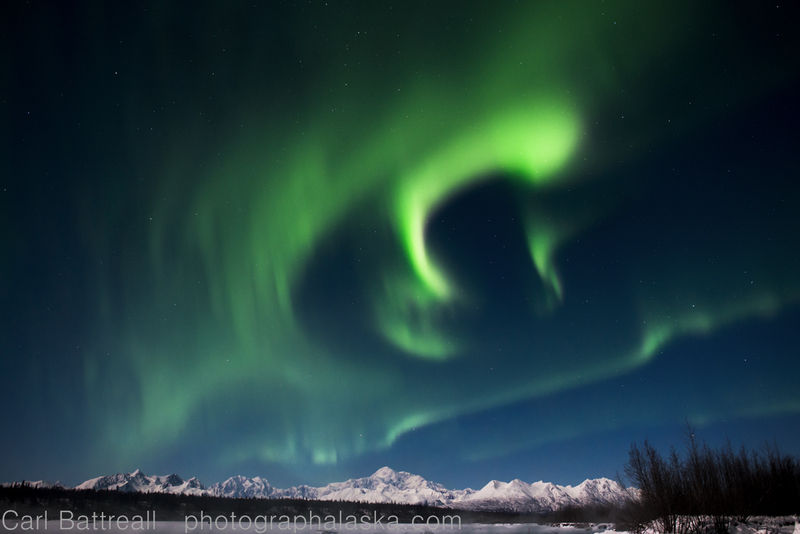 I have been on over twenty expeditions in the Alaska Range and have never had a chance to photograph the Aurora Borealis. It’s not that I haven’t seen them, I have, but I never had an opportunity to photograph them. 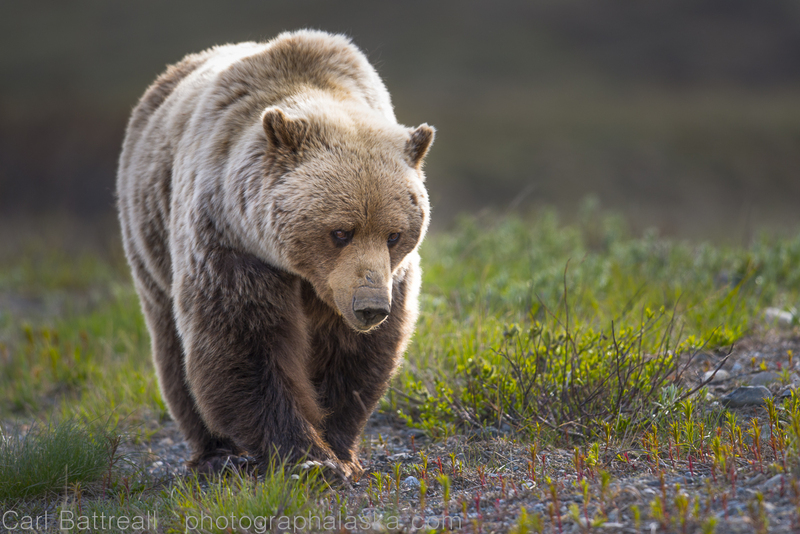 I was hoping to photograph them on last year’s Gillam Glacier trip. We had seven days of crystal clear skies and the setting was perfect, with towering peaks in all directions, but the lights refused to dance for me. Part of me just wanted to let it go, to forget about them, but I decided that the Aurora did play a part in the Alaska Range story and should be included, so I decided to go “Aurora Chasing”. I watched the weather forecast and the aurora forecast simultaneously, looking for the perfect combination. Last weekend, the two lined up and I felt I would have a good chance of photographing them. It was also a full moon, which was perfect for illuminating the mountains but also required that I put extra effort into finding a good foreground, something many night photographers overlook. I seduced my two regular partners in adventure crime, Opie and Sy and we headed up to Denali State Park, the closet access point into the Alaska Range from Anchorage. Up to that point, we had a record-setting warm fall and winter. I had a feeling that there would be some open water, which could act as an interesting foreground. We arrive at the South Denali Overlook around 11:00. It was stunning, super clear with the mountains exploding out of the ground. I was tempted to stay high, with unobstructed views. It would be easy to head up higher towards Curry Ridge or Kesugi Ridge, we had skis and sleds, but I wanted something different. 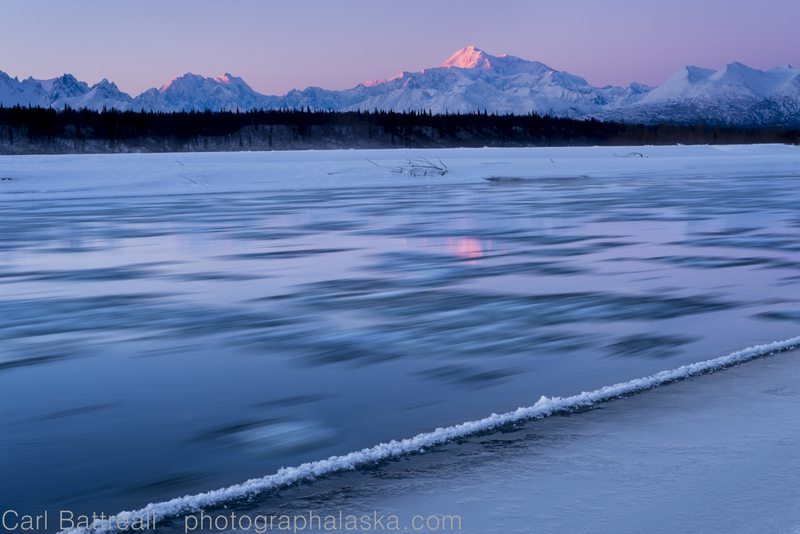 Moving river ice and the last light on Denali. I could see that the Chulitna River was open with moving ice in it, that was what I was looking for. Dropping down to the river would mean we would lose many of the mountains, so it was important we found a spot with plenty of open space. We loaded up sleds and packs, leaving the skis behind. It was a crisp 0F at the car and we knew that it would be a solid 10 degrees colder down by the river. We post holed and bush-whacked our way down the steep cliff to the river floor. Within a few minutes we found a perfect spot for camp and photography. The Chulitna River was really flowing and was deep and swift. It was pretty scary, being that close to it. I truly hate cold water and the thought of making a stupid mistake at 4 in the morning, like getting too close to the edge and busting through the ice was very unappealing. There was a lot of thin ledges of over hanging ice with deep water underneath, I even put a foot through some ice, that I thought was thick enough and far from the open water, I was wrong. I spent a good amount of time scouting locations, marking safe places where I could set up. It was similar to the precautions I make on glaciers, when our camp is surrounded by crevasses, I mark safe areas to photograph for late at night and when I am tired. We were amazed how quickly the day ends in January, before we knew it, the mountains were bathed in beautiful pink light. The pink light was quickly replaced by the white light of the amazing moon, so bold and powerful. The shadows of the trees stretched with its arrival. Around 5:00PM we decided to begin brewing hot drinks and food. We couldn’t get the stove lit, for some reason the bottle wouldn’t hold pressure. Turning on our headlamps (the moon was so bright, we didn’t really need them) we realized that fuel was pouring out pump, total failure. We didn’t bring a second pump because this was just a quick, overnight trip. We decided to go old school and make a fire. Opie and Sy went into the willows and alders like ravenous beavers, dragging out log after log of dead wood. The fire worked well and before we knew it, hot food and drinks were plentiful. We kept the fire sizzling the rest of he night. The first glimpse of the lady Aurora showed as a gentle glow north behind the mountains. With each hour it would move higher into the sky and quicken its movements. Photographing the aurora is not easy. Of course, modern cameras are amazing and have greatly simplified and improved the quality of aurora photography. A quick search online and you realize how popular aurora photography is. 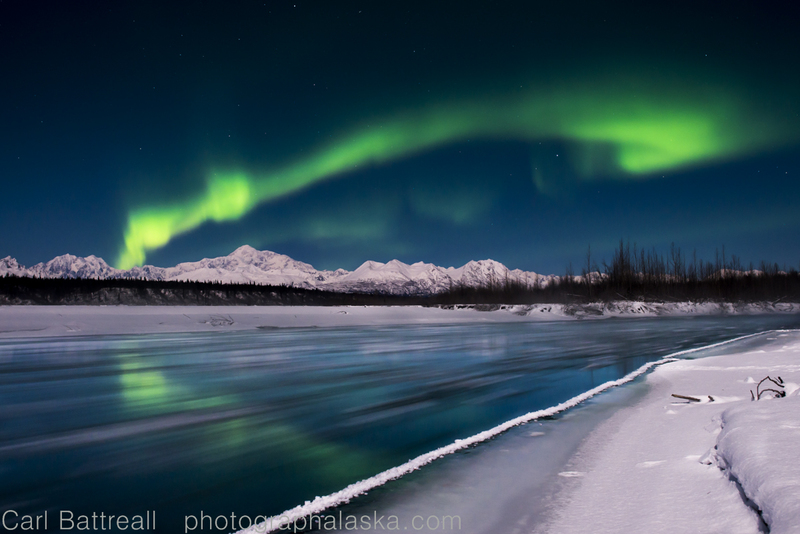 Aurora over Denali and the moving ice in the Chulitna River on a full moon night. Because of the bright moon, I wanted to include some nice foreground. My first challenge was to get decent depth of field in the image. 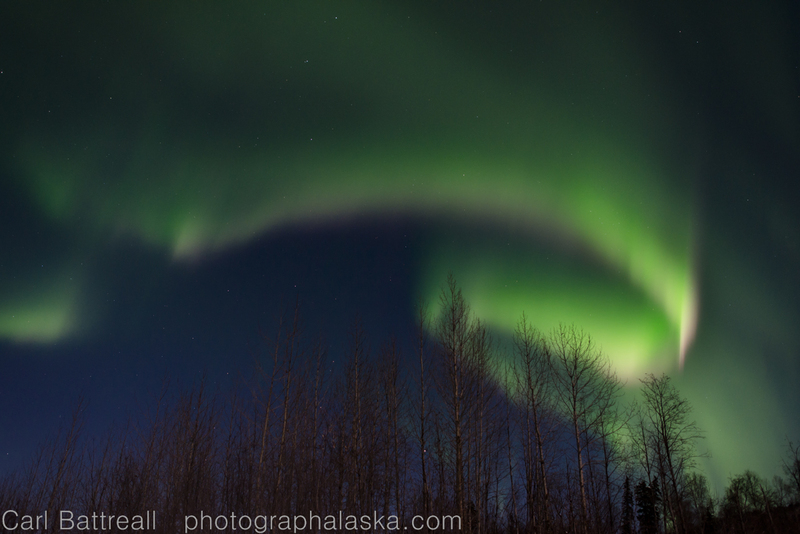 The other challenge was to have a quick enough shutter to stop the dancing aurora. Too long of an exposure and the aurora becomes more of a smooth splash of color instead of dancing swirls and waves. Huge aurora band over Hunter and Denali. I kept my ISO around 800 and stopped the lens to about F4. This gave exposures around 4-6 seconds, really fast for night photography, that was because of the full moon and the reflected light off the snow. A few images I stopped down to f5.6, but then the exposures became 15 seconds and the aurora was less defined, I increased the ISO to 1600, the max I am happy with on my d800e, which quickened the exposure but there was some detail loss in the mountains. Critical focus is key with night photography. 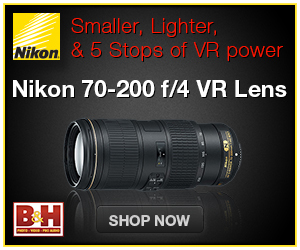 The infinity mark on most AF lenses isn’t really infinity, you can’t just manually set it and shoot. The best method is switch to live view, zoom in on a star and manually focus it. Seasoned aurora and night photographer then tape the lens so the focus can’t get changed, I forgot the tape so each time I put my camera away during a lull in the activity, or switched lenses, I would have to re-focus when I pull it back out, lame on my part. Somebody turn out the lights! 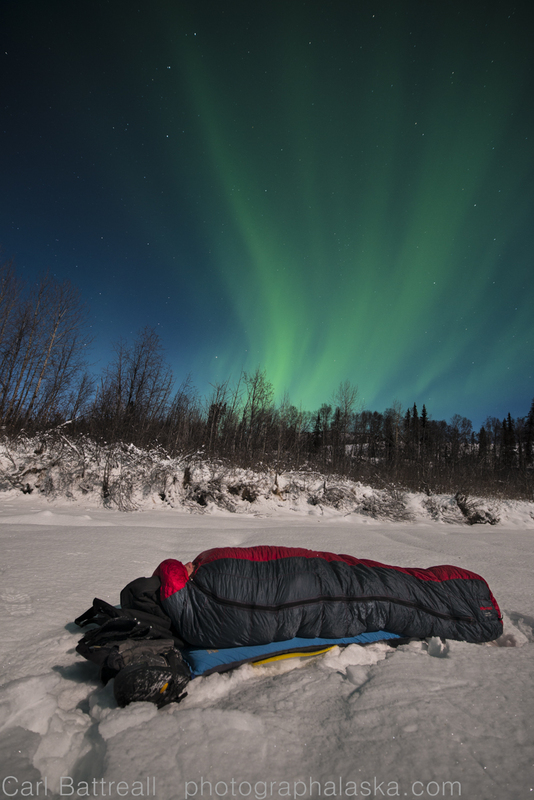 Its wasn’t the cold that kept us awake, it was the full moon and the aurora! By 2:00AM the aurora had moved south-east and directly above us and away from the mountains. 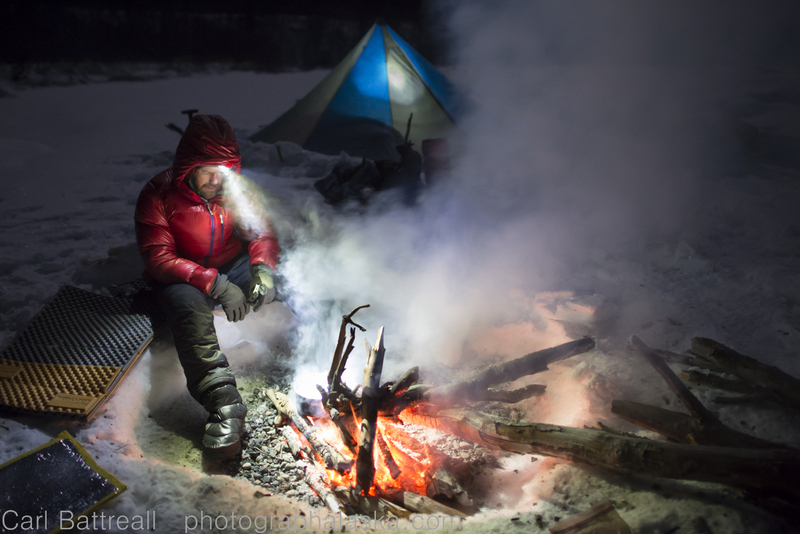 The three of us were frozen stiff, even with the fire going and filled with hot drinks, sitting around 10 hours at -15F, your body finally says “Get moving or crawl into you bag!”. So we crawled into our bags and tried to settle in. I got up to pee around 4:00AM and the aurora was bursting from the sky. It looked like color rain pouring down on me, it was the mighty corona aurora. I thought of putting all my warm gear back on and dragging the cameras out but decided to just enjoy the lights, sometimes, my best experiences are when the camera is put away. The lights begin to move south east away from the mountains, but grew in intensity. I woke to catch the sunrise on the mountains, but the camera gear would have none of that. As soon as I took the lens cap off the lenses, they were coated with a sheet of ice. Oh well, I did laps around camp to stay warm, watching the amazing scene in front of me. Soon Sy and Opie woke to enjoy the scene. With no stove and the fire stone dead, we quickly made haste out of there. It was great experience. Good friends experiencing a truly dazzling night together, I would happily have cold feet and hands again to share that experience with others. It is something every Alaskan should do, get out of your comfort zone and experience one of the great light shows on Earth. 2014 was a wild year, full of drama and spectacular wilderness. It started off strong, with two amazing trips and then slowly deteriorated, with family emergencies, wicked weather and cancelled trips. 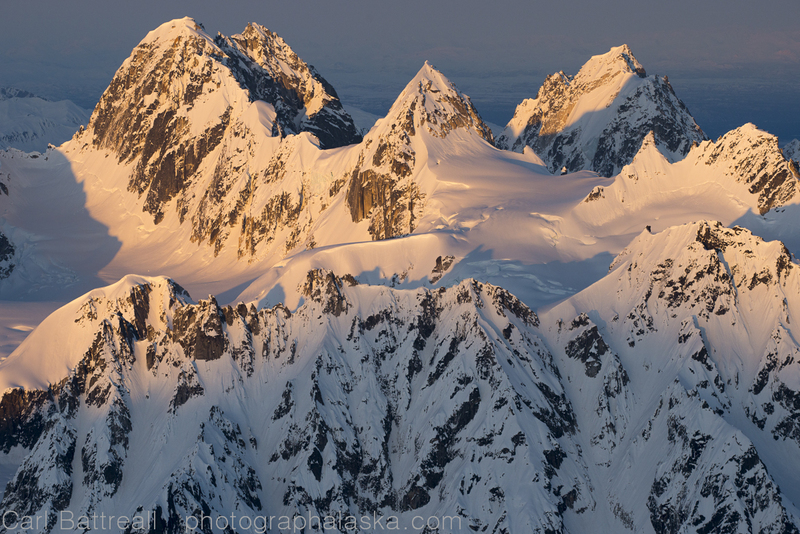 However, I made some strong images for the book and feel confident that this will be an exciting publication and a real tribute to the mighty Alaska Range. I want to give a big thanks to everyone who helped spread the word in 2014. Images from the project were printed in United States, Japan, Germany, France and Italy. The biggest exposure came from online venues including: The Adventure Journal, Mother Nature Network, Project Pressure, Adventurers and Scientists for Conservation, National Geographic Adventure Blog and Nature Photographers Network. Photographs from the project were used by numerous climbers from all over the world. With the help from my images, some of them made hard, first ascents. I hope to add a climber support section to the blog this year. My expedition partners are key to the project’s success, so a big thanks to: Sy, Opie, Phil, Brian, Julie, my Dad and my wife Pam and son Walker. A special thanks to all the pilots who flew me into the wilderness this year including: Jim Cummings, Jim Green and OE. Thanks to all the 2014 project sponsors and supporters including: The American Alpine Club, The Mountaineering Club of Alaska, Patagonia, Black Diamond, Naneu, Alaska Alpine Adventures and The Alaska Center for the Environment. And final shout to Kate and the crew at The Mountaineers Books for all their support and for making this project a reality. Wild weather on Denali. The mountain is notorious for terrible weather. 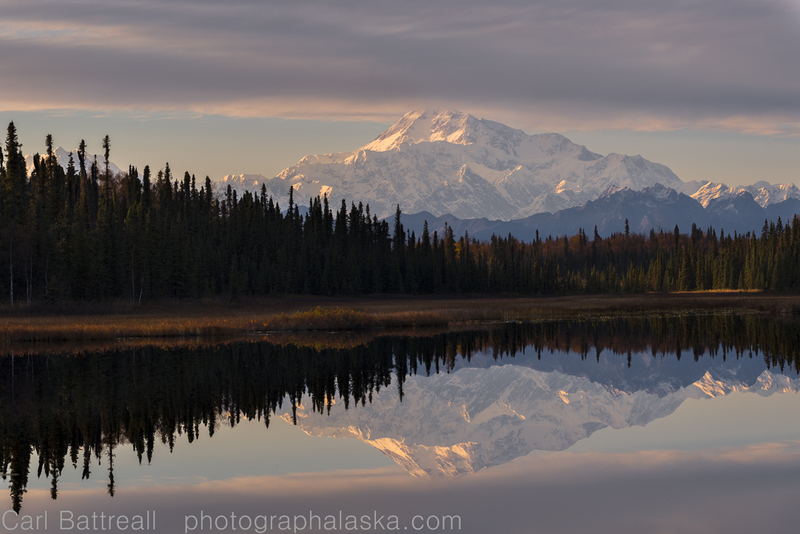 Denali reflection, taken from the south. 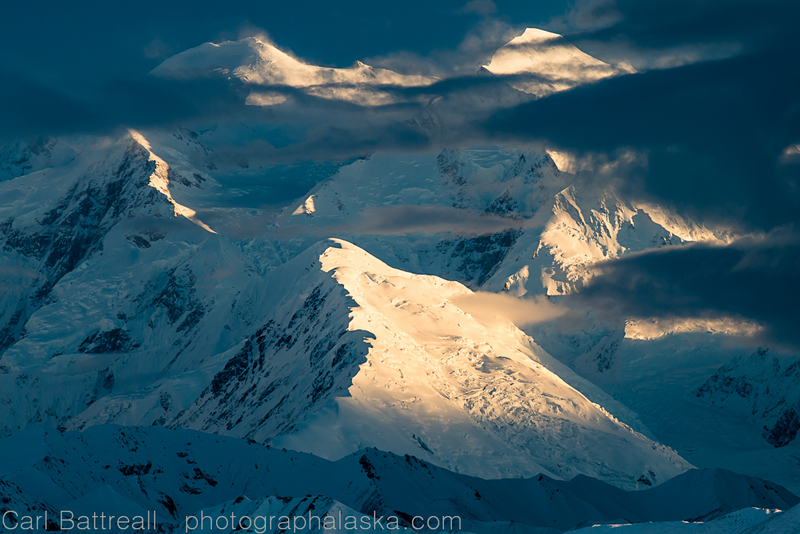 Denali, taken from the North. 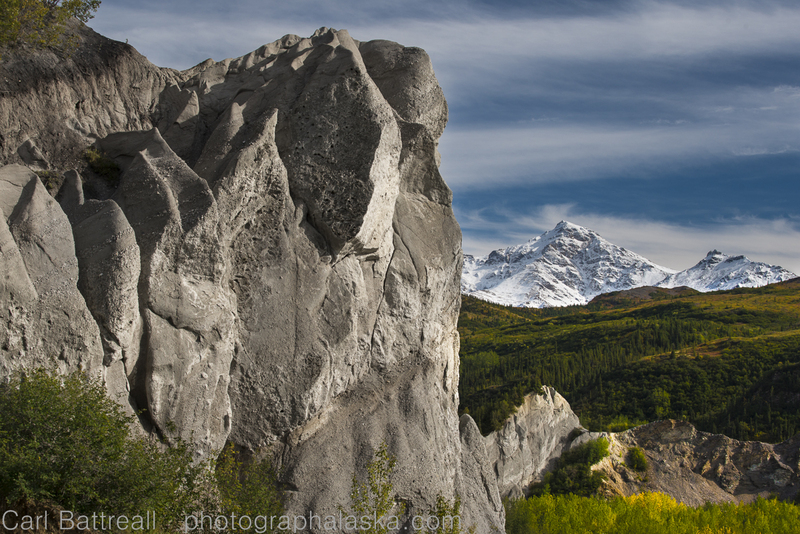 Sandstone formations, central Alaska Range. 1:00am sunset lights the rain, sky and river. Mixed light and Mount Deborah. Shadow and Mount Geist. This is the lovely west face. Sy on the summit of peak 8514 during its first ascent, Nutzotin Mountains. 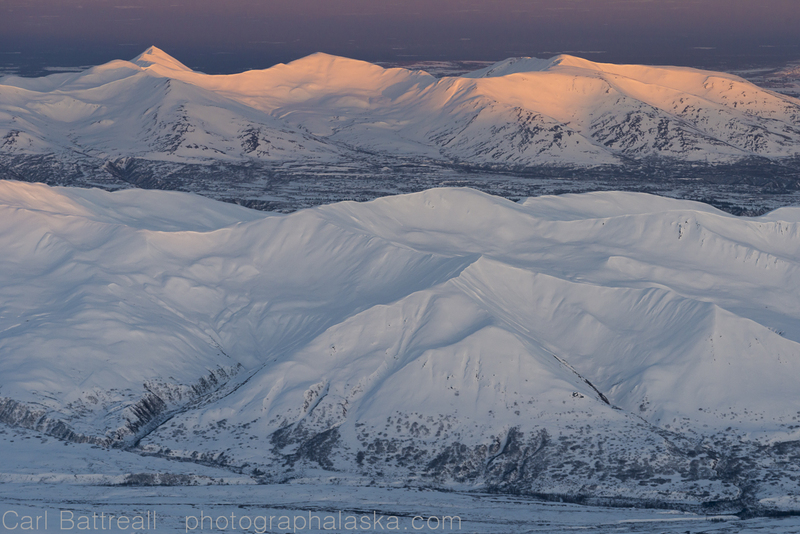 I am starting a new little series on the blog, short mountain profiles from the Alaska Range. From the famous to the nameless, unclimbed to overrun, I will try to cover a variety. Some mountains I have many images, others only one. First up, the most famous mountain of them all, Denali. Denali needs little introduction. The tallest mountain in North American, it is the most sought after peak in North America, by climbers and tourist alike. Its official name is “Mount McKinley”. The quickest way to show someone you’re not from Alaska is to call it Mount McKinley instead of Denali. 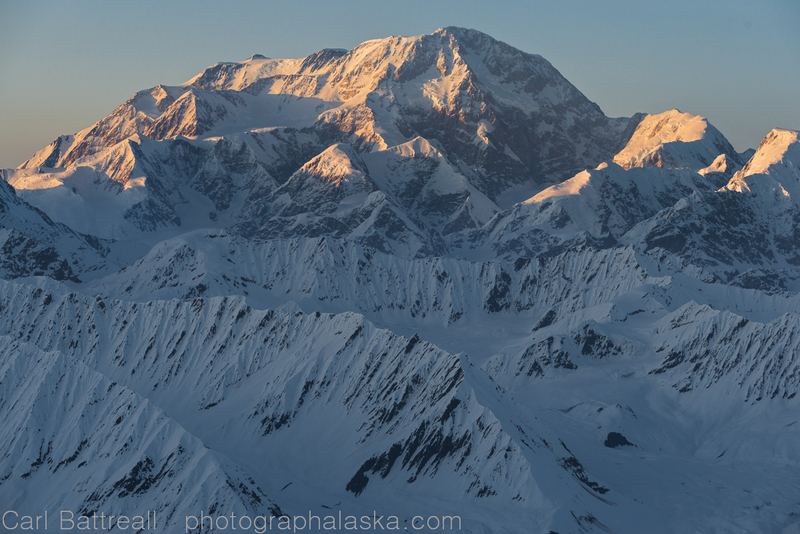 The word Denali is Athabaskan and roughly translates to “The High One” or “The Great One”. 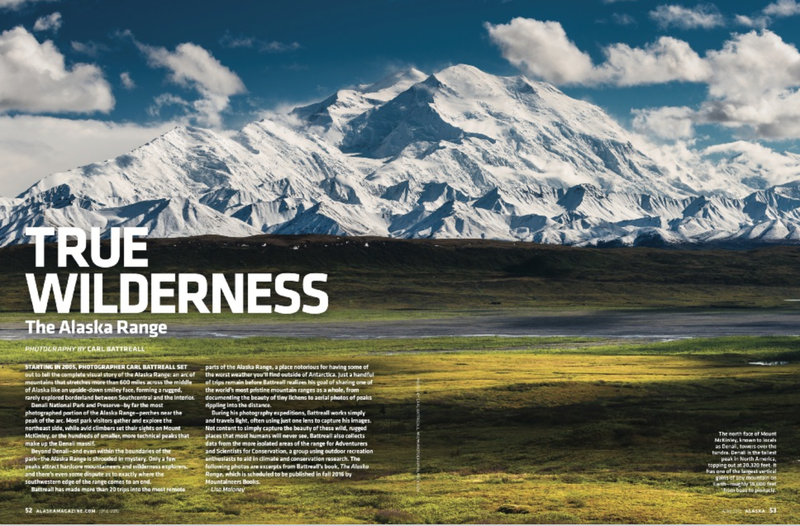 Not only is Denali the tallest mountain in North America it is also one of the largest on Earth with a vertical gain that rivals most mountains in the world, surpassing Everest by over 4,000 feet. 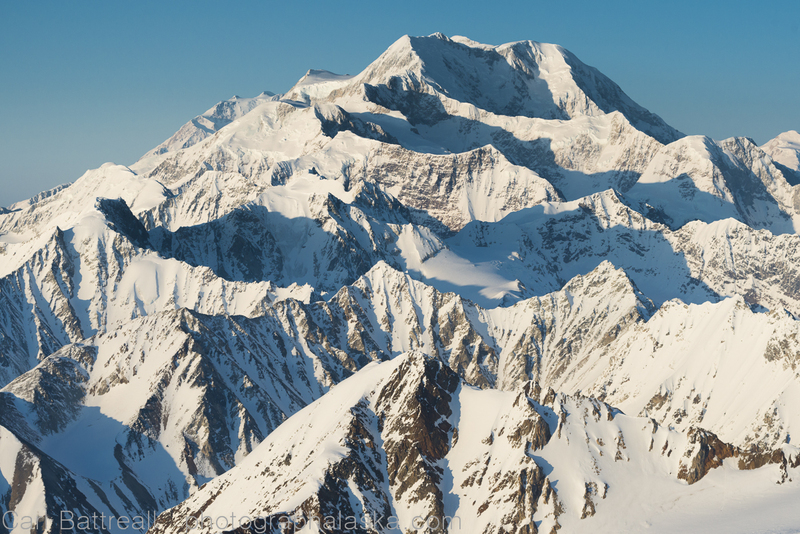 This image is taken from the north and highlights Denali’s massive size and the wicked Wickersham Wall. The first ascent of Denali was in 1910 when two Alaskan prospectors—Peter Anderson and Billy Taylor—from a party of four reached the summit on summit on April 3. They climbed 8,000 feet from their 11,000-foot camp to the summit and returned to camp in 18 hours. The Sourdough Expedition team were climbing novices who spent 3 months climbing to win a bet with a bar owner who said it would never be climbed. They wore homemade gear made mostly from caribou fur. On summit day, they carried doughnuts, caribou meat, 3 flasks of hot drinks, and a 14-foot-long spruce pole and an American flag. unfortunately, they climbed the North Summit, not realizing that the South Summit was taller. Many of the old-time climbers that I know still give them credit for the first ascent. The first ascent of the higher South Summit was on June 7, 1913 by Walter Harper, Harry Karstens, and Robert Tatum from an expedition led by Hudson Stuck. They climbed the Muldrow Glacier route. Is Denali shrinking? It was originally surveyed at 20,320 feet (6,194 meters) above sea level, which was established in 1952. However, a survey conducted in 2010 using modern technology pegged Denali’s elevation as 20,237 feet (6,168 meters), shrinking it by 83 feet (26 meters). Many people reject this new height. 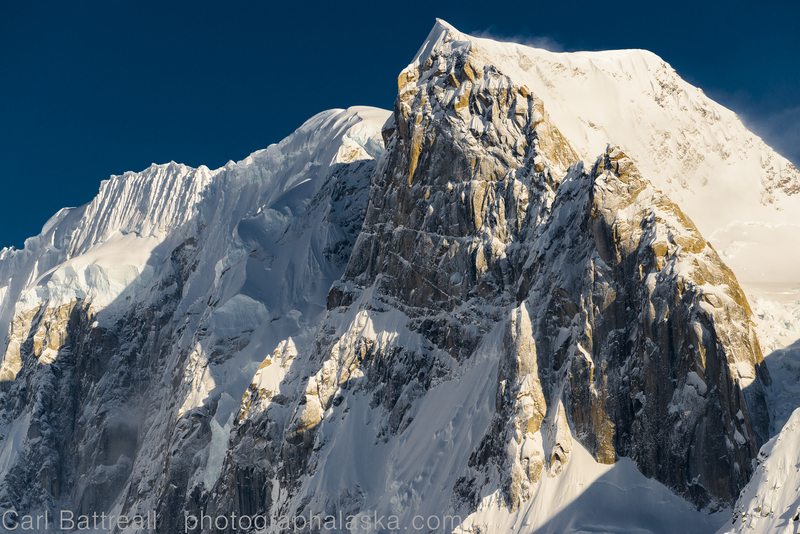 Denali is a tough mountain to photograph. 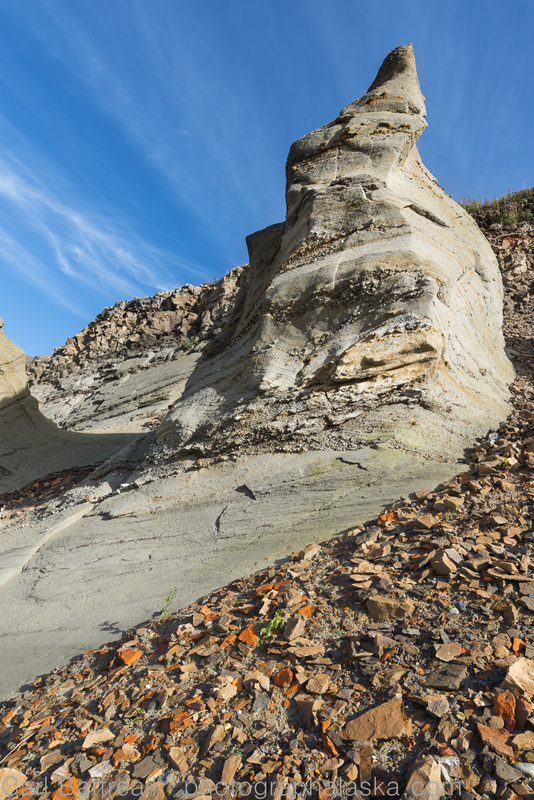 While it can be seen from many vantage points from around south-central Alaska, it is hard to find something unique. If you get too close to the monster, it becomes a shapeless mass, it is better to capture it from a distance, which helps highlight its massive size. 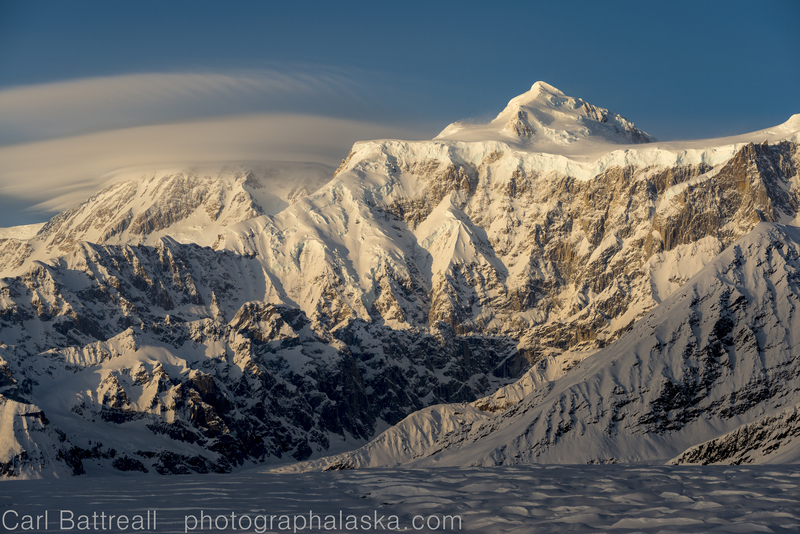 Denali is often capped with a cloud. Denali creates its own weather and tourist have about a 30% chance of a clear enough day to see the mountain’s summit. The weather here in Alaska has been off the charts, warm and beautiful. 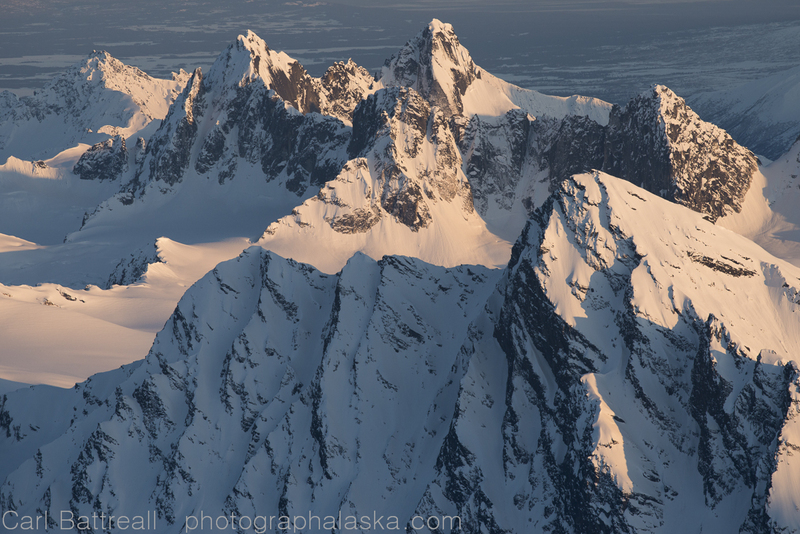 My friend OE and I have been trying to match schedules and we finally had the opportunity to go for an evening flight in the Alaska Range. We left Birchwood in his little Pacer around 7:30 and landed back in Birchwood at 10:30! It was a fantastic flight. The warm, windy days and lack of moisture have created some haze, even in the big mountains. The light never got really dynamic but it was still a beautiful and photographically successful trip. OE’s Pacer is a great little photo plane and I am looking forward to a few more spring flights before my summer expedition schedule goes into full swing. 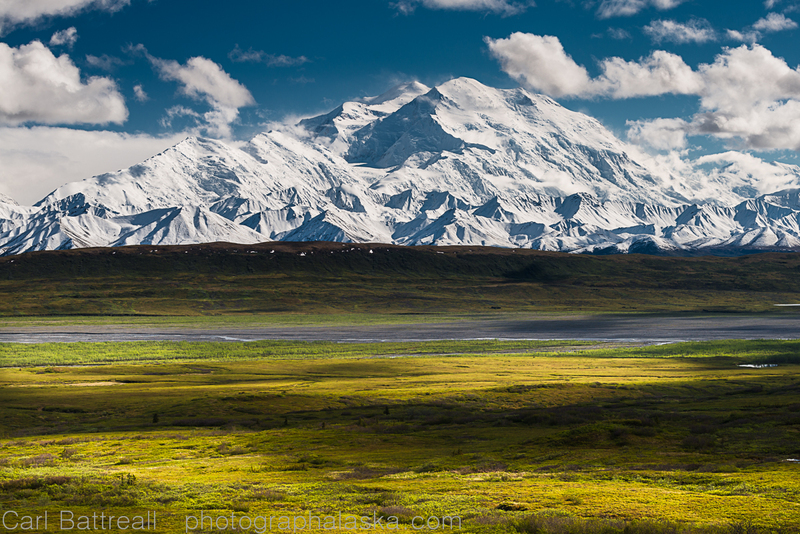 The beautiful Mount Russell, Denali National Park and Preserve. 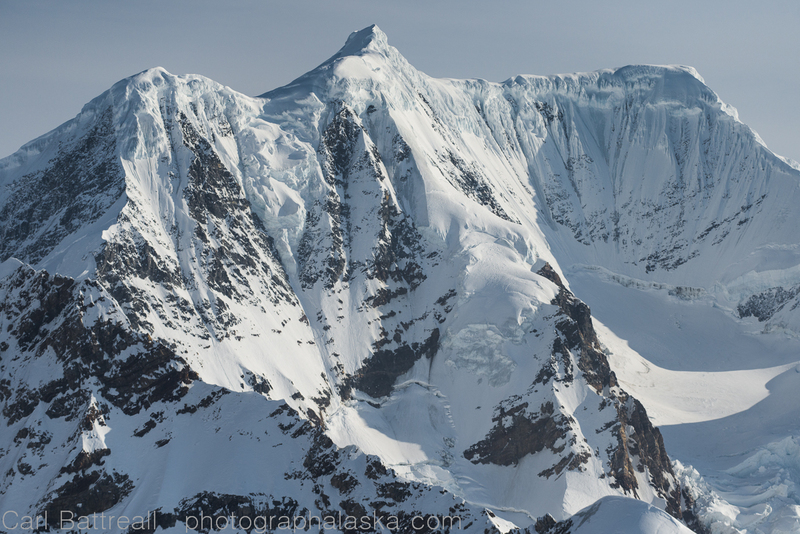 I have returned from my latest journey in the Alaska Range. I flew into “Moraine Lake”, the terminal lake of the Backside Glacier. 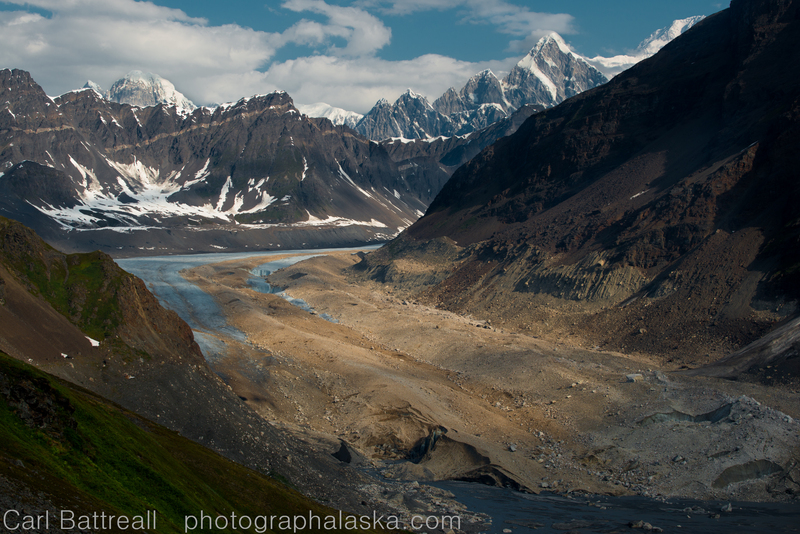 The Backside Glacier descends behind the legendary peaks of the Ruth Gorge, in-between the Tokositna and Ruth Glaciers. 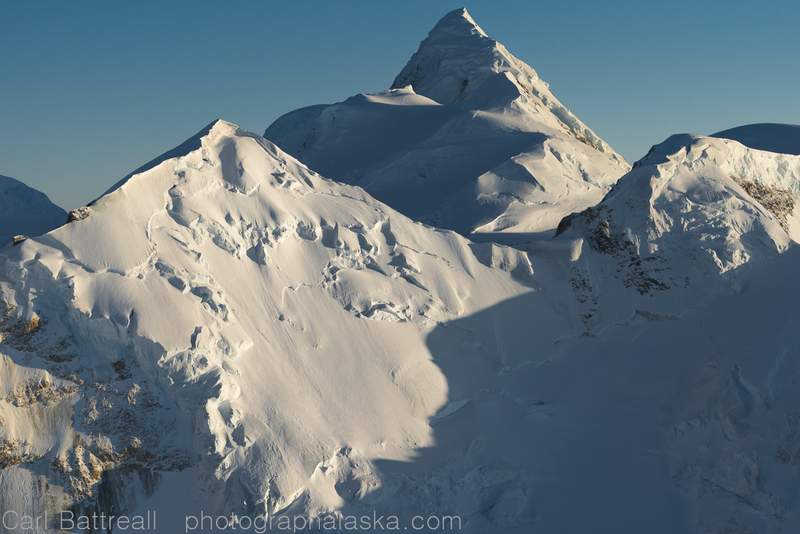 I flew in with Alaska Range Project sponsor, K2 Aviation, on a glorious and unusually warm day. A heat wave had locked Alaska in a dry, record-setting summer and the day was blazing hot and uncomfortably sunny. This was my first time in the area and I had trouble deciding where I wanted to explore. I had to either go high for the views or head up glacier. Unnamed mountains reflected in Lima Bean Lake (local name). I choose to go high and camped near a small alpine lake. 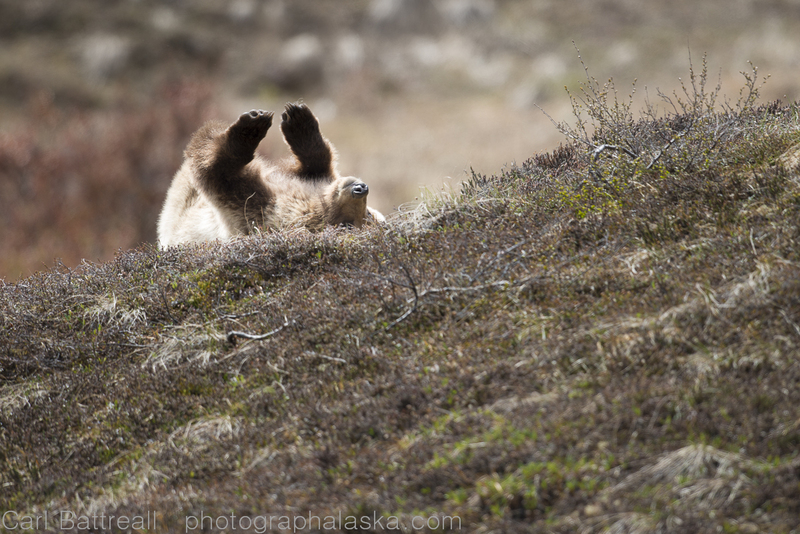 Photographing in Alaska in the summer, near the solstice, is hard. The days are long and the sun stays high for most of the day. Sunset was 11:59 and sunrise was around 4:00. The sky never really gets dark and rarely does that magic, alpine light happen. That was the case on this trip. In nine days I never witnessed any sunset/sunrise colors. 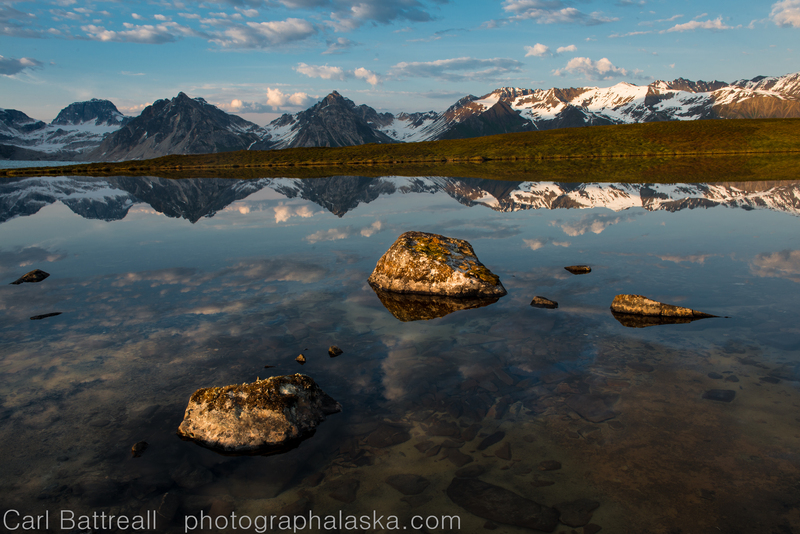 Working in variable, less-than-pleasing light is key to mountain and wilderness photography. Rarely do you have time to wait for the perfect light, the weather changes too quickly or you have to keep moving and work with the light you’ve got. There is always a pleasing angle of a mountain in every type of light, but being on the correct side of the mountain when the light is right is what is so difficult. 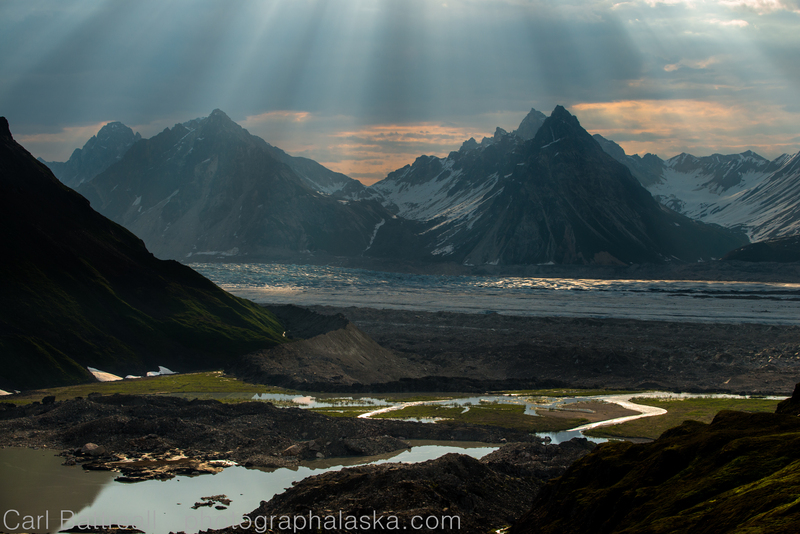 Light beams above the Ruth Glacier. Hazy days make for interesting light. The first few days were hot and the sky was hazy and kind of grey. After spending some time up high I decided to head down and up the Backside Glacier. The Backside Glacier is a stellar glacier with lots of unique features. 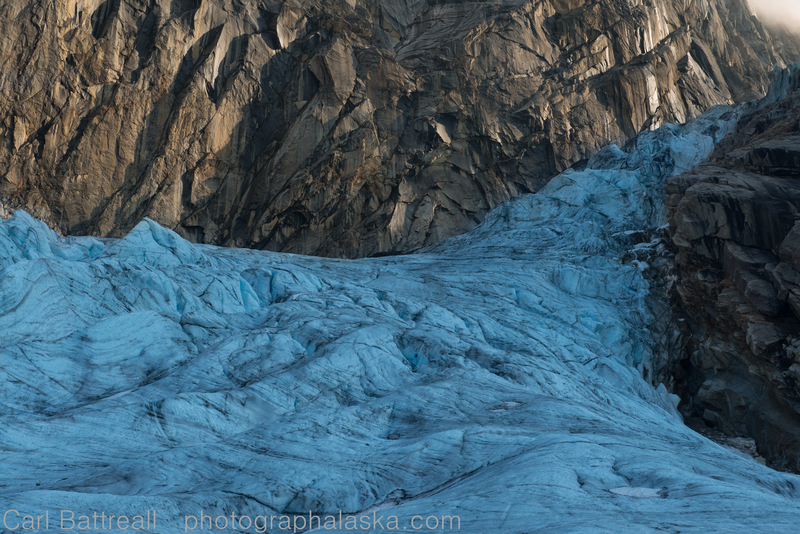 I headed up glacier to the firn line and camped along the eastern lateral moraine. Melt water stream on the Backside Glacier. It was a bright and sunny day so I had to use a ten-stop ND filter too slow down the exposure. 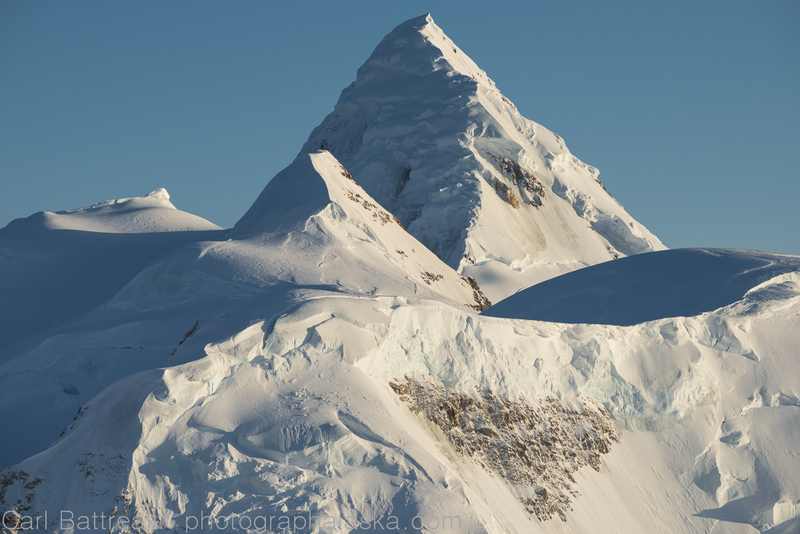 After I set up camp I tried to push up a series of side glaciers that descend from Mount Church and Mount Johnson. Within a few minutes I found myself stuck in one of the most spectacular thunder storms I have ever been in. The rain was relentless, pushing its way right through the “waterproof” nylon on my tent fly. The lighting lit up the sky and the pounding thunder echoed off the granite walls that surrounded me, It was both amazing and terrifying. The storm lasted about three hours. The shadow of Mount Church is projected into the clouds by the rising sun. 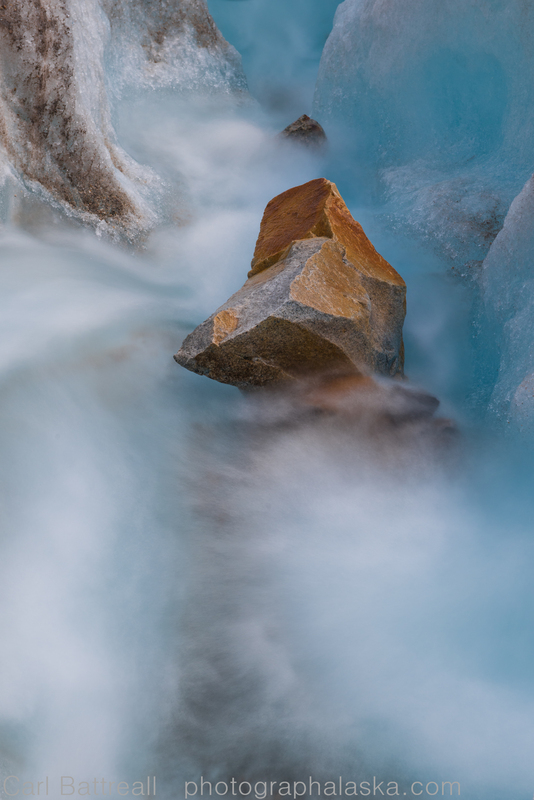 Cold glacier and warm rock. Mount Johnson. I headed up the side glaciers the next morning. A fantastic shadow of Mount Church was being projected, by the rising sun, on the clouds behind the glaciers. 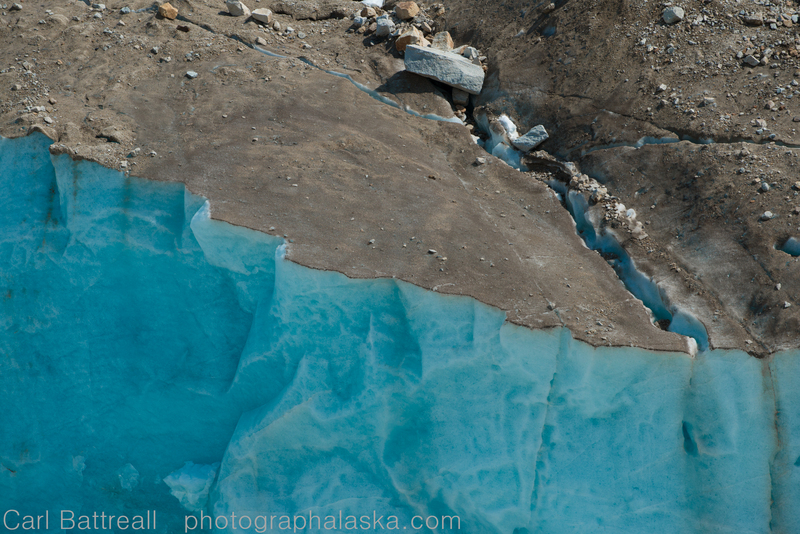 The cool color of the glacier was a great contrast to the warm colored rock and light on the big walls of Mount Jonhson. 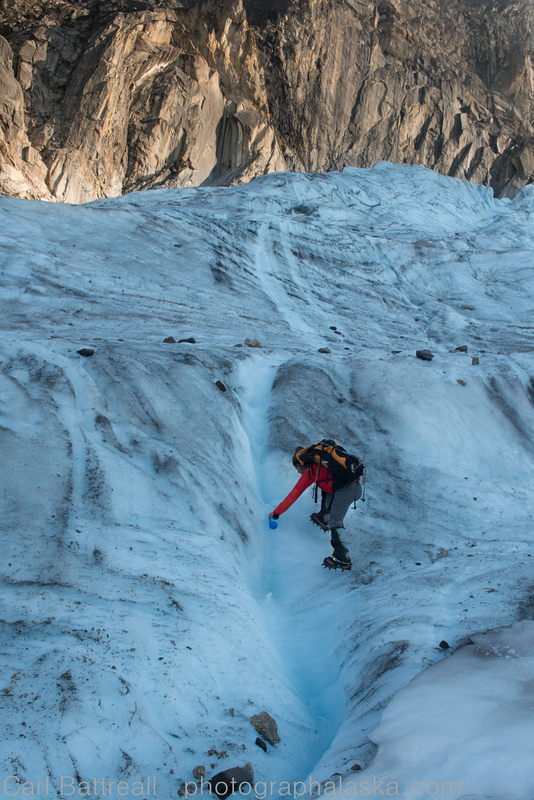 I spent the rest of the day exploring the Backside Glacier and collecting water samples in partnership with Adventurers and Scientists for Conservation. I collected samples from melt-water on the surface of the glacier, from the outflow, Moraine Lake, the outflow of the lake and the river. I also collected samples from fresh water streams that descended into the lake. The impressive gorge that prevents access onto the Ruth Glacier. 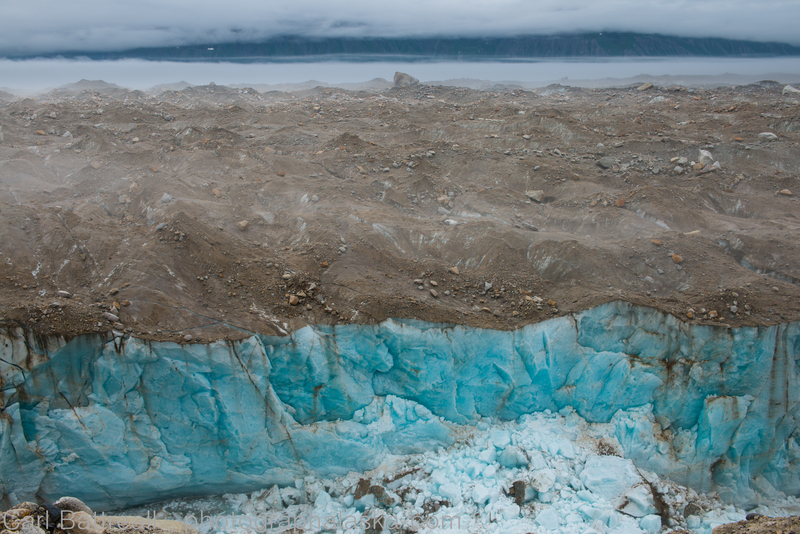 Brown and Blue, Ruth Glacier. The next day the weather changed from hot and sunny to cool and wet. I set up camp where my clients would be camping the next four days. The tail end of my trip I would be co-guiding a hiking trip for Alaska Range Project sponsor Alaska Alpine Adventures. 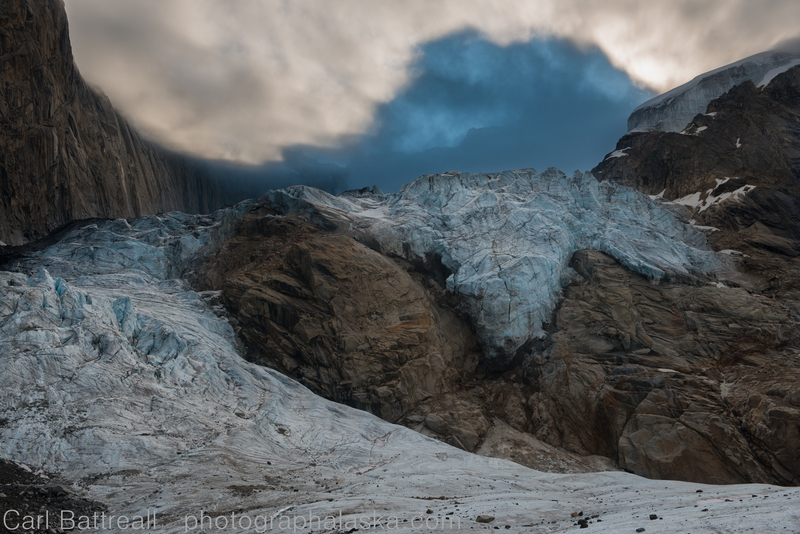 After setting up camp, I decided to try and access the Ruth Glacier, but a spectacular canyon prevents travel between the glacier and the lateral moraine. I hiked along the edge for a few miles until it finally ended. 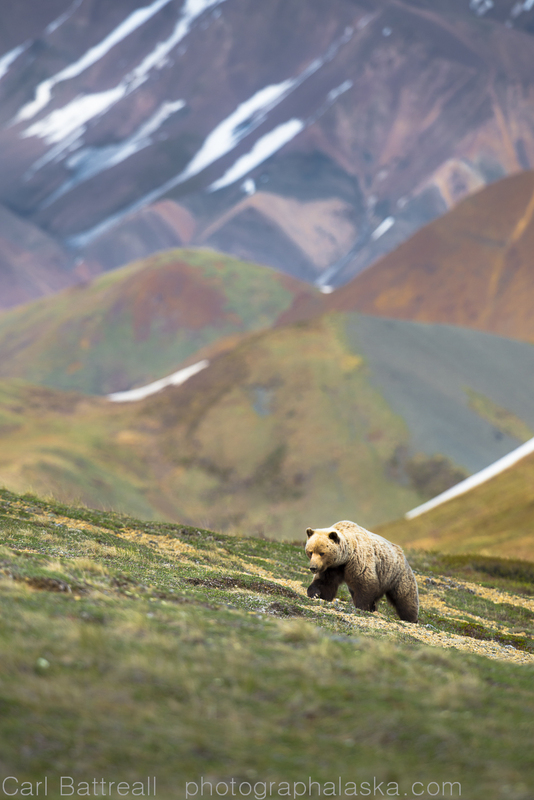 Right when I was about to cross onto the glacier I spotted a black bear traveling on the tundra hills above me. Not usually a concern except I had heard there was a problem bear around, and this bear was walking in the same direction as my camp. 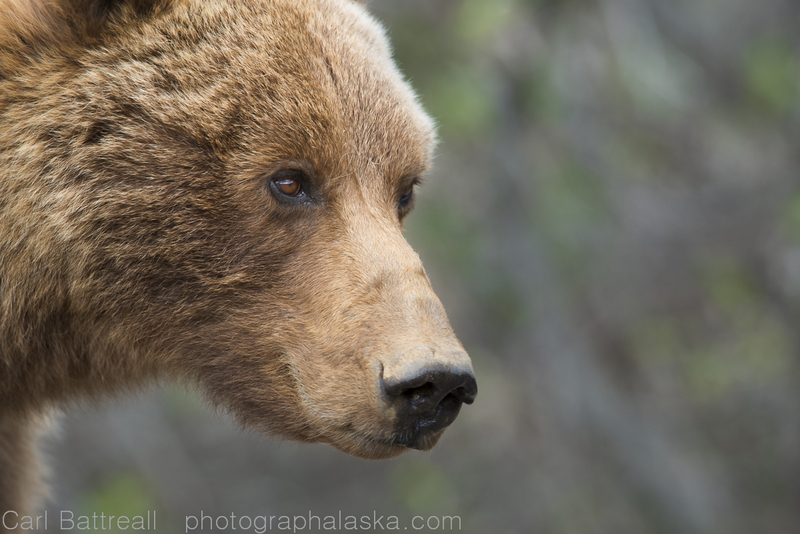 I then realized what a bad idea it was to camp alone in an established camp area that I was sure the bear knew all about. I followed the bear as it walked along the hillside. There is a section where the hill ends right in the river and you need to side-hill above it. Just as I was reaching that point, the bear decided to descend the hill to the river. “Don’t mess with my stuff bear!” I kept yelling. I once had a tent, sleeping bags and Therm-a-Rest pads get destroyed by a curious black that thought our stuff was fun. I got louder and more aggressive as he headed straight for my tent. Luckily, my badgering seemed to be annoying him enough that he made one circle around the tent and then continued up the bank. 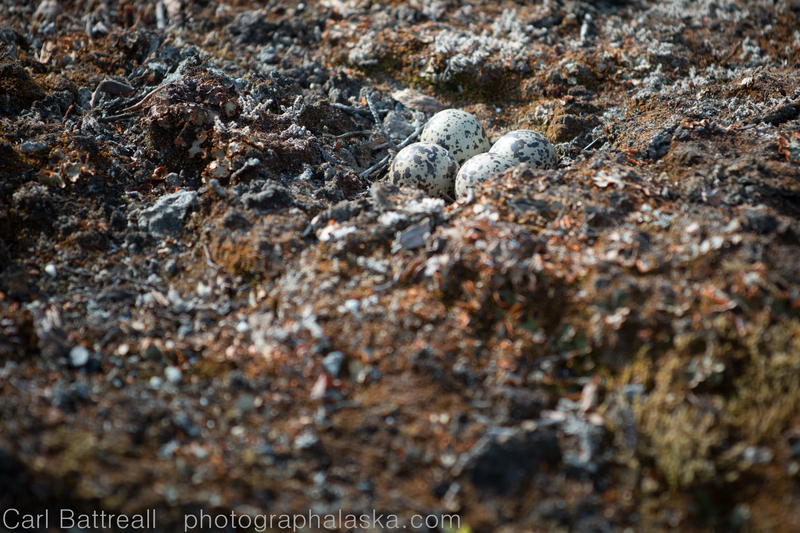 Mother Plover pretending to be injured in order to lure me away from her eggs. This area is strange to me. 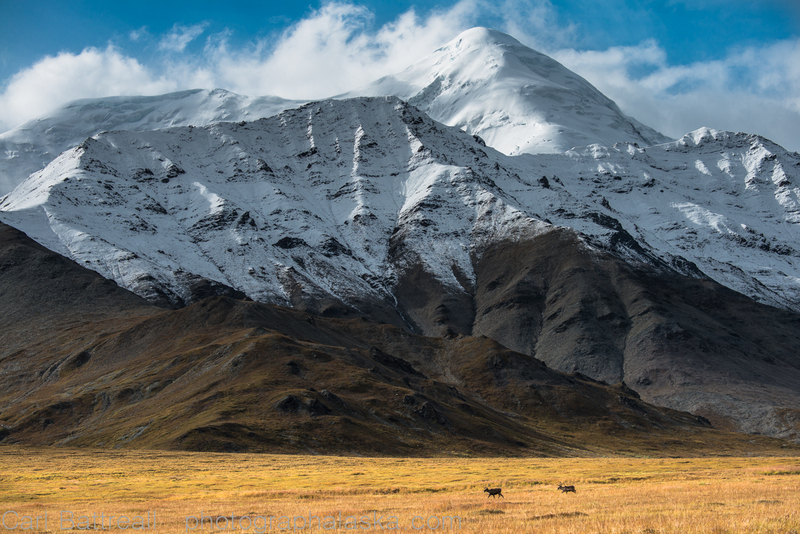 It seems like a perfect place for large mammals, especially Dall Sheep and caribou. However, the only large animals are black bears. 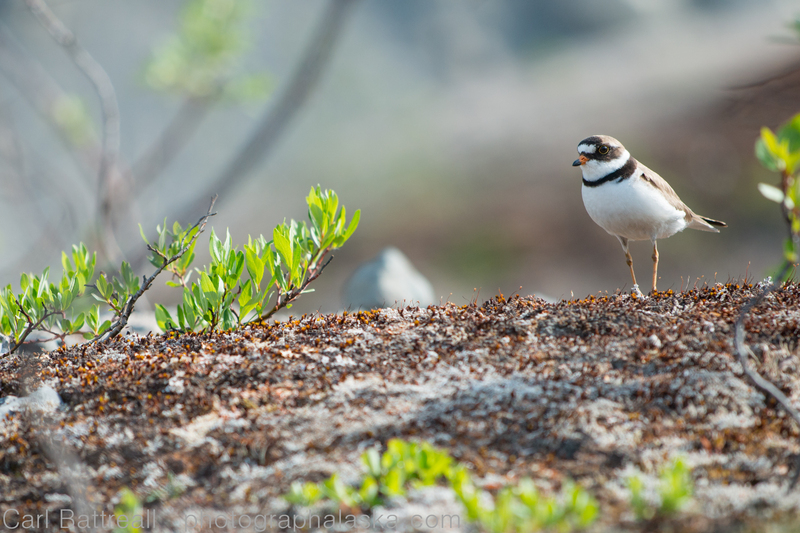 I spent the rest of that day photographing some of the birds and rodents that make their home in this wild country. 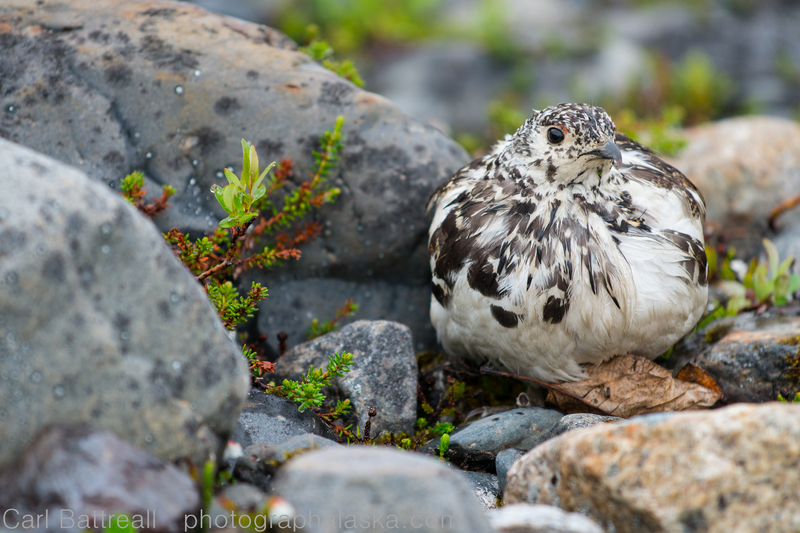 I found a Plover nest and the little mother came running over, chirping at me. 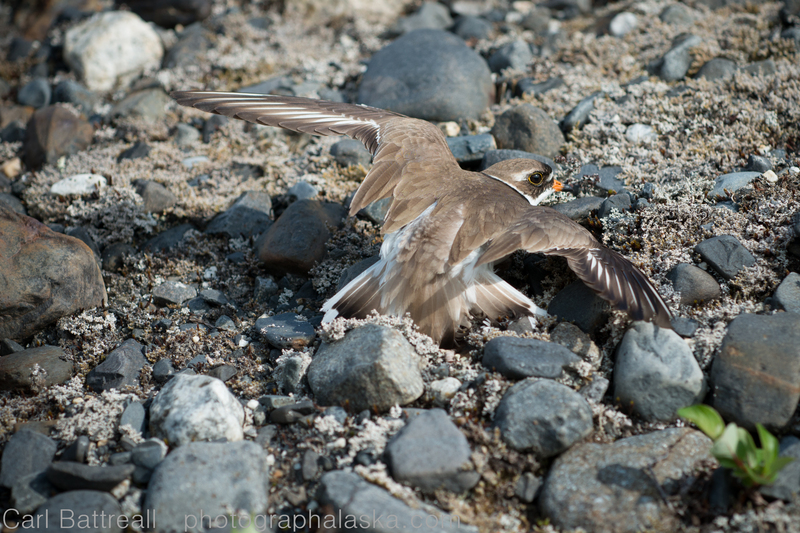 Then she pretended to be hurt and flopped her way away from the nest, hoping I would follow. I obliged and followed her until she felt I was far enough away from the nest and then she gave up her performance. The next day the hiking clients showed up. They were a great group, four different countries and languages were represented. During their four days, the weather was pretty terrible, but their excitement and joy of being in Alaska and the mountains could not be crushed by the heavy weather. I don’t do a lot guiding these days but it was an enjoyable trip and fellow guide Mario, was a great guy to guide with. It wasn’t the best trip photographically, I got a few, book worthy images, but I had trouble getting into the right state of mind and couldn’t figuring out want I wanted to show of this unique area. I had no issues with D800e on this trip. I am now backing for my next trip, a 60 mile traverse of the Neacola Range.